Am J Med. 2018 Mar;131(3):317.e1-317.e10. doi: 10.1016/j.amjmed.2017.09.048. Epub 2017 Oct 20. Outcomes in Severe Hyponatremia Treated With and Without Desmopressin. Hyponatremia is a vexing problem. At #NephJC, we have covered it many times: the discussion on the European guidelines, and the cause of thiazide-induced hyponatremia. Even at #NephMadness, hyponatremia has returned this year with an entire region devoted to it. The big reason why hyponatremia is so painful, is that the treatment can sometimes be worse than the disease: the dreaded osmotic demyelination syndrome (ODS), previously known as central pontine myelinolysis. Into this mix, is thrown the concept of using ddAVP in its management. No, we are not discussing 'like cures like' here - ddAVP is being considered for its extremely potent anti-diuretic properties. Lest your head explode with the thought of conserving water in a water-excess condition, here is how it might help (and it is thoughtfully discussed in these guidelines) - in three different ways as explained by the authors of paper we are discussing. Proactive strategy: in patients at high risk of ODS, using ddAVP creates a condition of therapeutic SIADH. One combines ddAVP every 6-8 hours with a slow infusion of hypertonic saline, and titrate the doses to have a controlled rise in serum sodium, usually ~ 6 mmol/L/day. Rescue strategy: when you have already overcorrrected, so you administer ddAVP to actually lower the sodium down again, and then bring it up slowly. This has been shown to prevent ODS in animals, and a small case series suggests it is well tolerated in humans. What is the evidence of the effect of this strategy? Really not much, beyond the above-mentioned case series. Hence the European hyponatremia guidelines declined a firm recommendation of this approach. Into this void, step the authors to find and report some evidence - based on administrative data. A retrospective observational study, of admissions to two large academic hospitals in Toronto, from 2004 to 2014. Adult patients with severe hyponatremia (serum sodium < 123 mmol/L) admitted to the internal medicine service, or transferred to internal medicine were included. A few patients with non-hyponatremic reasons to use ddAVP were excluded (eg diabetes insipidus). The data was abstracted from the electronic medical record. The analysis was done using non-parametric methods (eg Wilcoxon) and the Bonferroni correction was applied given the multiple comparisons performed (see NephJC explainer on this in accompanying commentary). An impressive number of 1274 patients, with 1450 admissions were included in the analysis. 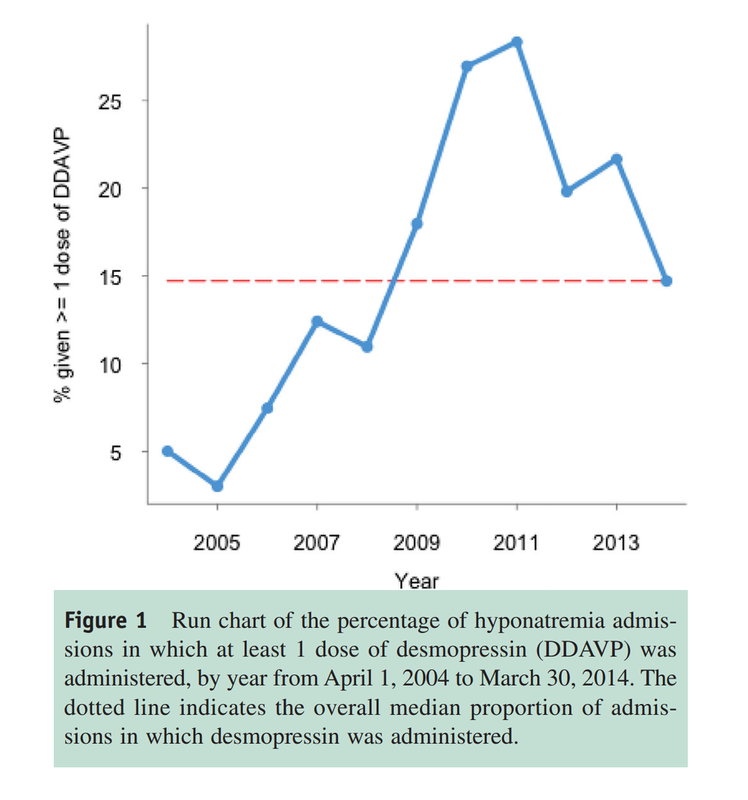 See figure below for usage of ddAVP over time, which was used in 254 admissions (17.5%). ddAVP was associated with lower rates of safe serum sodium correction. This probably reflects the use of reactive or rescue strategy where ddAVP was used *because* of rapid serum sodium rise. ddAVP use was associated with a lower mortality, and a higher serum sodium level at discharge. Table 2 describes the characteristics and outcomes based on the three strategies (as adjudicated by the authors) - with the reactive strategy being used most commonly (69%). Interestingly, the proactive strategy resulted in a safe correction in almost all patients, but was associated with a higher mortality than the other groups (note the small numbers. This is not a robust result, and the deaths were unrelated to hyponatremia). Additionally, none of the patients in the proactive strategy received 3% saline, so this is not the 'ddAVP clamp' strategy described above. Time to correction, and in hospital stay was significantly different (higher) in the proactive startegy group, as shown below. The cohort includes 4 cases of ODS (0.28%). In three of them the diagnosis was based on MRI findings, and in one it was a clinical diagnosis. The rate of sodium increase exceeded 8 mmol/L/day in 2 patients, but was less than 12 mmol/L/day in all of them . 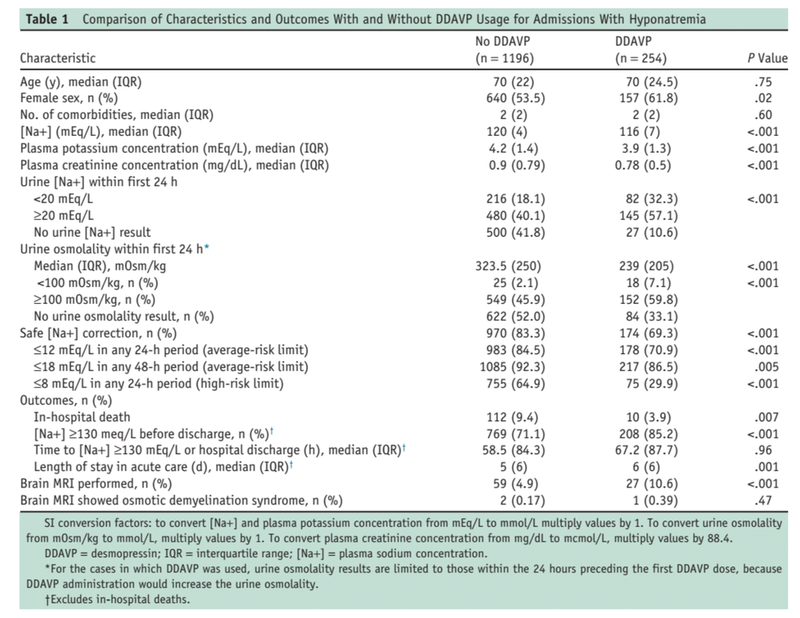 Additional supplementary data shows the cause of hyponatremia in the 28 patients who underwent the proactive strategy (table 2 below) and an adjusted analysis for mortality (showing benefit with ddAVP use). This is a commendable exercise using an administrative dataset to explore the effects of using ddAVP in severe hyponatremia. The strengths are mainly its sheer sample size, which dwarves the small case series reported so far. The low usage of hypertonic saline suggests these data are not useful if one is contemplating that approach - would using 3% saline have shortened the length of stay, which comes out as a potential drawback otherwise of using ddAVP? 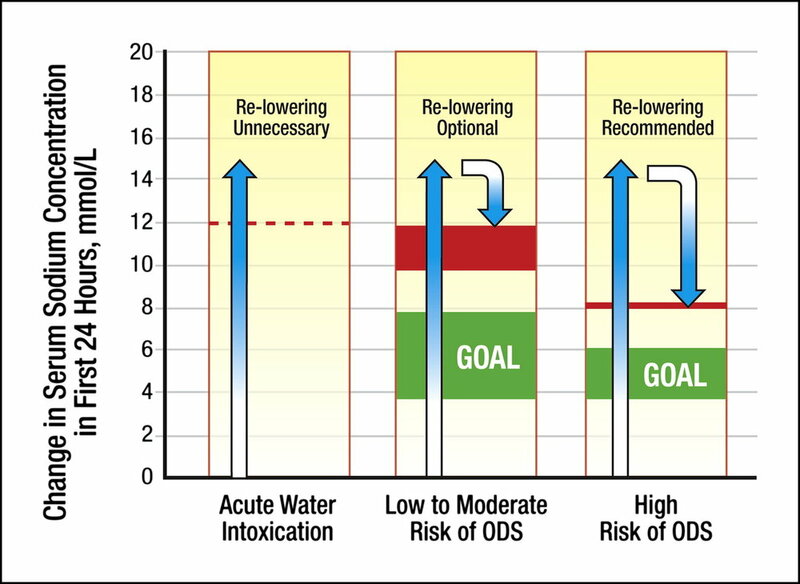 The data on ODS also supports the < 8 mmol/L/day approach in patients at risk for ODS. Join us to discuss this paper and its implications on March 27/28.